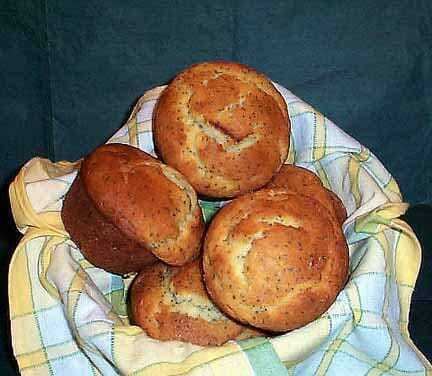 Home » Bread Recipes » Otis Spunkmeyer Almond Poppy Seed Muffins – make delicious muffins at home. Otis Spunkmeyer Almond Poppy Seed Muffins – make delicious muffins at home. You can’t go wrong with anything that has the Otis Spunkmeyer name on it. This is no exception. Make fresh Otis Spunkmeyer Almond Poppy Seed Muffins anytime with our secret recipe. Measure flour, salt, baking soda and baking powder and set aside. In mixing bowl beat softened butter, oil, and sugar until blended. Add eggs, vanilla, almond extract and sour cream to butter and oil. Blend until mixture is smooth, all moist ingredients should be blended well. Start adding the flour mixture to batter a little at a time until thoroughly blended but do not over beat. When mixed, remove from mixer and add poppy seeds. Stir with a spoon until completely mixed through. Place in muffin cups 3/4 full. Bake in a preheated oven at 375 degrees for 20 - 25 minutes. Check muffins with a toothpick. Do not over bake. Store in a sealed container. BTW: I’ve tried both yogurt and also fat free sour cream with this recipe. They’ve always risen nicely. It shouldn’t matter which you use with respect to rising, since both have similar consistancies and both are also acidic. My guess was a bad batch of soda or powder in the case where the muffins didn’t rise properly. Sub the sour cream for vanilla yogurt. Are you saying we should do this, or is this just a suggestion that you have? i made these and followed the recipe to a T and they didn’t really rise. i think it’s all the sour cream.